Our Executive 1 bedroom King Apartments at the 2012 Avoca complex are modern living spaces designed for 1-2 people to live comfortably in a home away from home environment. Each apartment is equipped with a king bed, r/c air-conditioning, a furnished balcony, fully equipped laundry, large flat screen TV, DVD and stereo. The kitchens are so well equipped you can cook a 5 course meal. The apartments are located in a secure residential building with secure basement carparking, bbq area and outdoor swimming pool. We pride ourselves on creating a place for you to come home to and believe that the comforts of home are too important to skimp on. 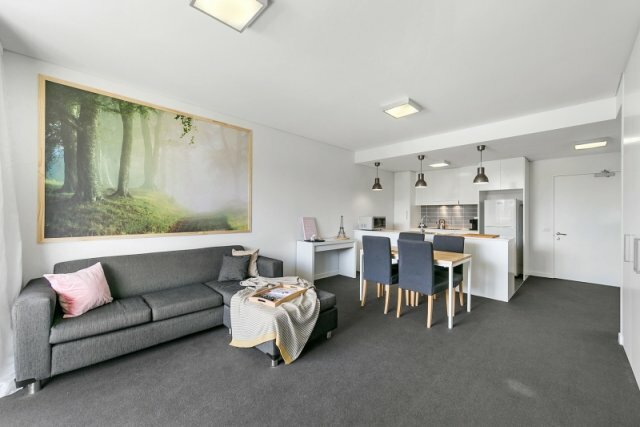 Bring your suitcase, buy a few groceries from the Woden Westfield just across the road and live comfortably for as long as you need.